This amazing new Park Square designed and built 8 Bedroom 5 Bathroom l , is ready to book right now on Solterra Resort! Just 8 miles from Disney, and within easy reach of the fabulous restaurants and the Champions Gate area , this unique resort will provide a fabulous luxury clubhouse with cabanas , resort style pool with water slide sports and fitness center. 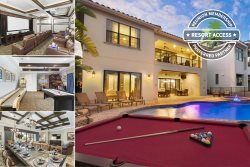 This spacious bedroom luxury vacation rental makes sure there is complete comfort and luxury living for large groups for a vacation of a lifetime. Providing 3800 sq ft of air conditioned living space, the property offers 4 fabulous king sized bedroom 2 of which are on suites, 2 Queen bedrooms with private en suite bathrooms and a further 2 rooms with 2 twin beds. The gorgeous covered 320 sq ft lanai and over sized pool deck awaits! The large open layout of the ground floor, provides a spacious family living space for your guests to relax in comfort and style. With a well equipped kitchen, including granite counter tops and stainless steel appliances, your guests can enjoy their favorite snacks and meals whenever you wish. (Large grocery stores are a short drive away from Solterra Resort !) A four seat breakfast bar is perfect for socializing while your designated chef is preparing meals and always popular with the kids at breakfast time. Just a few paces away, a dining table makes a perfect spot for family dinners, as you chat about the day's adventures at the theme parks! With views over the pool deck, the family living area includes comfortable seating, sectional sofa and a large TV. Upstairs, the loft area provides a second social gathering area, with comfortable seating, games area and large TV. The west facing pool deck is perfect for guests to relax, and cool off after a big day of fun in the Florida sun. The private spillover spa helps you soak away in style and the pool is always a key feature for kids to burn off any surplus energy that may be left after their visits to Universal, SeaWorld or Disney World! With sun loungers, and a oversized covered lanai, you have plenty of opportunity to enjoy Orlando's beautiful weather, day or night.